If you haven’t yet, we would like to encourage you to take a moment to download and install our mobile app for your Android or Apple device. 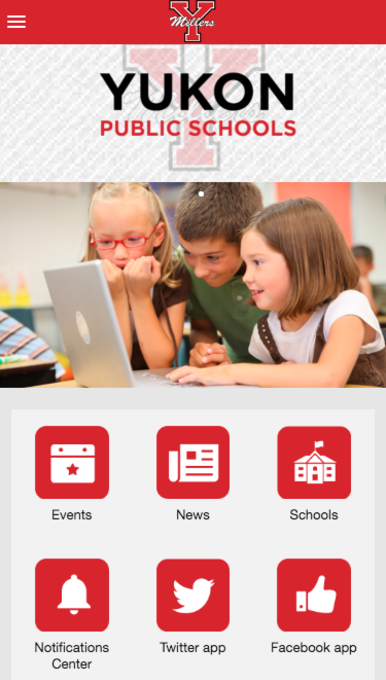 Just search for the name "Yukon Schools" in the Apple App Store or Google Play Store, click on the buttons to the right (desktop and tablet views) or the the buttons at the bottom, if viewing this website on your mobile phone. For Android users: Once you’ve downloaded our app from Google Play, you will be prompted to grant the app access to certain information and functions on your device. This is a completely standard part of many apps and is necessary to make sure your data is secure and that the app stays up to date with the latest school information. Below is a brief explanation of these permissions and the reasons you will want to accept giving our app access to them. Identity: The app needs to access the account profile data on your device in order to receive push notifications from the schools and in the event you would like to share the app via email with your friends and family. Calendar: Calendar permission allows you to download events from schools, which is an essential part of our app. Photos/Media/Files: This permission allows our app to store and display images and PDF files directly on your device for easy access.